The Morris Thompson Center Turns 10! Ten years ago, the Morris Thompson Cultural and Visitors Center opened its doors to the public. It’s home to rich information, history and plentiful resources. It has a gift shop, cultural information and handmade Alaska Native arts and crafts. Whether you’re visiting Alaska or a long-time resident, anyone interested in the culture of Interior Alaska should visit. After reading the information below, you’ll see why we at Explore Fairbanks advise people that the Morris Thompson Center should be the first stop upon arriving in Fairbanks. 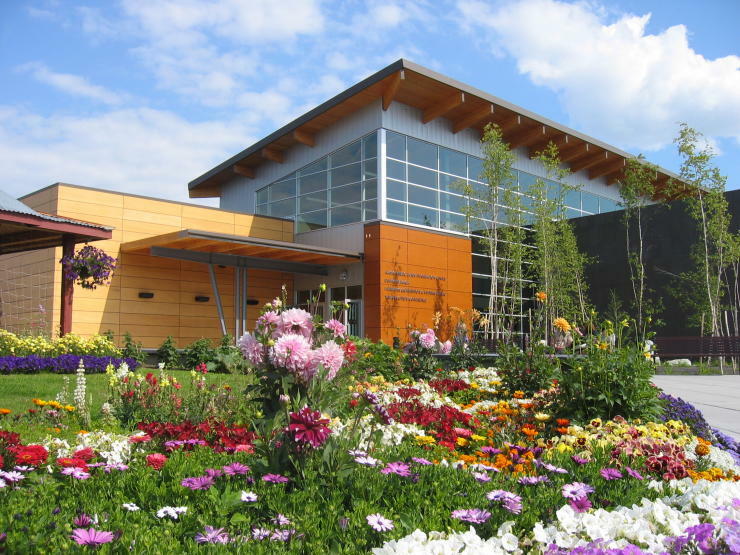 The Center is home to Explore Fairbanks, Alaska Public Lands Information Center, an Alaska Geographic store, Denakkanaaga and Tanana Chiefs Conference Cultural Programs. 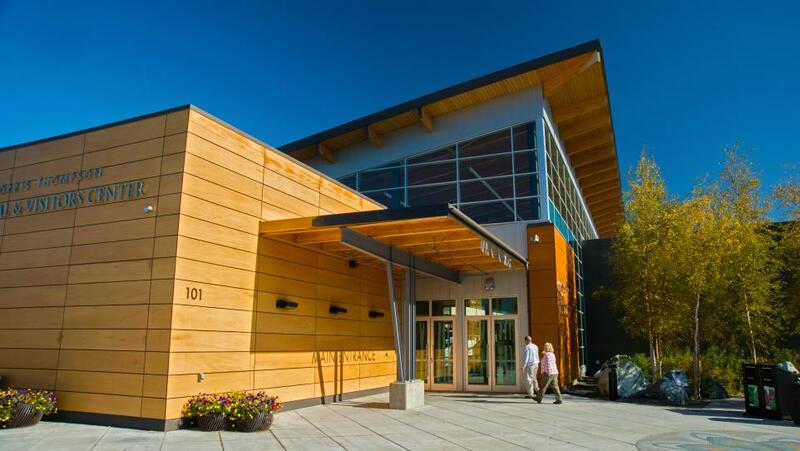 Constructed in downtown Fairbanks along the Chena River, the building was built to “green” standards. The building has one of the best local examples of native landscaping in the area. Plant materials surrounding the building reflect the ethnobotany of both the early native culture and of the more recent turn of the century pioneers. A popular feature is the Antler Arch, designed and built by local artist Sandy Jamieson, which has become a popular spot for selfies, group shots and even weddings. Surrounding the building along the walkways, look for beautiful tile mosaics depicting traditional Athabascan beadwork. The Center also connects to the Riverwalk and bike paths for easy access to downtown and strolling along the Chena River. View the live Antler Arch webcam at the Morris Thompson Cultural and Visitors Center. Catch a glimpse inside life in Fairbanks and the surrounding region within the 9,000-square foot exhibition. Visitors step through the four seasons and learn what life in Alaska is like, complete with replicas of animals and beautiful landscapes. One of the more popular sections is a replica public-use cabin with a projected view of the dancing aurora right outside the cabin window. Best of all, it’s world class and it’s free! Exhibits vary from exquisite dioramas to incredible Alaska Native art to full-size, interactive replicas illustrating life in Interior Alaska. On the first floor, there are many resources for tours, accommodations and exploring the region’s public lands. Explore Fairbanks - Visitor Information Specialists share their knowledge and love for Fairbanks with visitors and locals alike and provide information on attractions, services and driving directions. There&apos;s a plethora of free information like brochures, maps and guidebooks as well. Also, if you’ve seen the northern lights or went to the Arctic Circle during your time in the Fairbanks area, stop by for an official certificate! The Alaska Public Lands Information Center - Need assistance discovering Alaska’s Public Lands? Rangers are available to assist in planning through “one-stop shopping” for information, maps, trip-planning and resource education. They also offer scheduled films, special events and programs throughout the year. Alaska Geographic – With the motto “Connecting people to Alaska’s public lands,” the Alaska Geographic gift shop is worth the stop. Within you will find high-quality interpretive books and products that will help you explore and appreciate the flora and fauna of Alaska. If you see the aurora borealis or cross the Arctic Circle on your travels, stop by the Morris Thompson Cultural and Visitors Center for official certificates, and go home with certifiable bragging rights! The Morris Thompson Center is a wonderful place to experience Alaska Native art, music, stories and dance. In partnership with the Tanana Chiefs Conference (TCC) Cultural Programs, there are many opportunities for immersive experiences that take place regularly. For more information on these, call 907-459-3741 or email. Cultural Connections Show – In the summer, Alaska Native youth provide a glimpse into their culture as they tell stories, sing, and spin across the stage dancing traditional jigs. Portraits in Athabascan Garments - Bring home photos of you and your loved ones dressed in extraordinary furs and moose hide garments. Traditional Athabascan garments like these are typically only seen at special events or displayed behind glass at a museum. Here you can examine the beadwork up close, smell the moosehide, and learn how these clothes were made from wolf, muskrat, wolverine and beaver fur. Make It & Take It - Work with an Alaska Native artist to create your own pair of dentalium shell or porcupine quill earrings, beaded bracelet or necklace. Learn how porcupine quills are collected and prepared, and how dentalium shells and glass beads became part of traditional Athabascan beadwork. I SPY Scavenger Hunt for Kids - An eagle, a moose, a bear and birds–there are more than 15 different animals throughout the exhibits. Kids of all ages can enjoy a self-directed I SPY Scavenger Hunt anytime. Check with the Rangers at the Alaska Public Lands Information counter for an I SPY worksheet, and see what you can spy with your little eye! First Fridays - The first Friday of each month, stop by from 5 to 8 p.m. for a reception featuring the work of an Interior Alaskan artist. Daily Films – Films about Alaska are shown throughout the day (and they are free!). Films about Alaska’s history, nature and culture are shown six or more times a day are played in the 100 seat, hi-def theatre and in the lobby’s cozy video nook. Local Alaska Native Elders and Youth play an important part in connecting Morris Thompson Center visitors to the cultures and traditions of Alaska&apos;s Interior. To celebrate the Morris Thompson Cultural and Visitors Center’s 10th year, we are happy to be involved in a fun Anniversary contest. Enter to win prizes including Alaska Native bead work, a dog mushing lesson, Fairbanks Concert Association tickets, hand-knits from Fairbanks Knitters LLC, passes to the Fountainhead Antique Auto Museum, and more! Using this entry form, complete the phrase “You know you’re in Alaska when…” You may use images or words to depict your idea: possible formats include drawing, a collage, an essay, or a poem. Submit your entry in person at the Morris Thompson Center, by mail, or by email (see instructions on the entry form). Ready to start planning your trip to Fairbanks, Alaska? Request a visitors guide today!